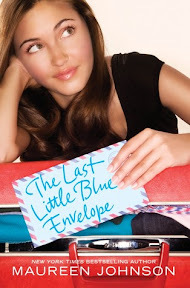 The Last Little Blue Envelope [Book Review] – my books. my life. When Ginny had her backpack stolen in Greece, she thought that final letter from her aunt was lost forever. Then one day she receives an email from a boy in London who has it. And before she knows it, she is on a plane for part two of her adventure. A few weeks ago I raved about 13 Little Blue Envelopes. It shouldn’t surprise you that it didn’t take me long to pick up the sequel. I read The Last Little Blue Envelope about as quickly as I devoured the first. And I enjoyed it almost as much. This time around, Ginny isn’t traveling alone. She has Keith with her. Which could be really romantic if it weren’t for the fact that Keith’s new girlfriend, Ellis, is also part of the gang. Not to mention Oliver, who is essentially blackmailing Ginny. The gang goes off to Paris, Amsterdam, and Dublin this time where things (surprise) don’t go as planned. I said I wasn’t thrilled with the romantic aspect of 13 Little Blue Envelopes and that feeling continued for me here. I knew what direction it was going to go and I just kept hoping I’d be wrong. Thankfully, Ginny and her adventures more than make up for any little issues I have. I recommend both books when you’re in the mood for something light and fun. Oh, I am sorry to hear that this one wasn’t as good as the first, but that you were able to devour it quickly anyway. It seems like there were a lot of other interfering characters in this one that weren’t there in the first book.